“Big Read” a Big success! 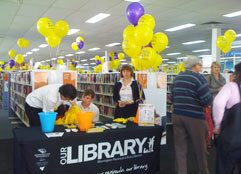 The festive atmosphere at Rosebud library was a welcome sight with bright yellow balloons festooned right throughout. It was a hive of activity last Saturday on the 25th of August as crowds poured in to participate in the fun-filled “Big Read” events. Children lined up to meet their favorite authors and get their books signed, while adults stopped to browse and engaged in interesting conversations with the local authors. 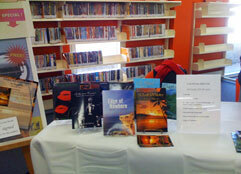 We had excellent results that day with several people purchasing signed copies. I was very pleased to meet other authors from the Peninsula and we enjoyed each others company immensely as we shared our literary experiences. The library staff were friendly and supportive and did a marvelous job promoting the event as the crowds did not ease till nearly closing time at 2pm. I will certainly be part of this event in 2013 too, as it’s a great way to promote my books and meet other writers out there. 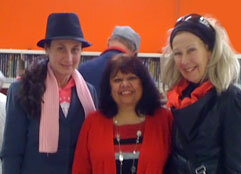 A great big thank you to the friendly staff at the library. Well done! “Dark Shores-Return to Serendib” just released! The long-awaited sequel to “Serendib-Isle of dreams” has just been released by AuthorHouse UK and is now available online through the publisher Author House, Amazon, directly from the author, and all major bookshops. There will be several promotional events in the forthcoming months. Dates and venues to be advised soon. 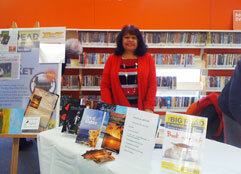 DYMOCKS SOUTHLAND BOOK PROMOTION JUNE 2011! What a wonderful event it was! Lots of excitement and fun, as crowds gathered around our group of six authors, signing copies of their unique books. The staff at Dymocks were exceptional and their assistance was invaluable. For those who missed out and couldn’t make it to Dymocks, you will be pleased to know that signed copies of my books are available for sale there. So be in early and get your signed copy at the same low price. AuthorsAustraliaInc. will continue promoting members’ books at various venues in future, and the events will be advertised well in advance, so that those who wish to attend will not miss out. A very big Thank You to everyone who assisted and made it such a great success!